Dora the Explorer: Swiper's Big Adventure! Game - Download and Play Free Version! 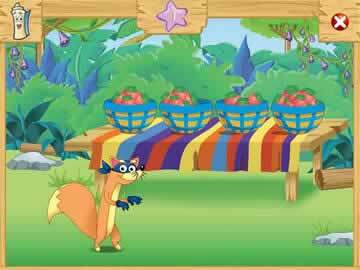 Home » Arcade Games » Dora the Explorer: Swiper's Big Adventure! Help Dora Save a Lost Baby Fox! 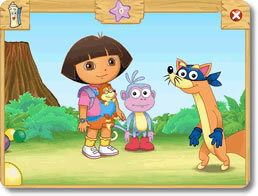 When Dora the Explorer finds a lost baby fox, she also gets another surprise: Swiper wants to help take the fox home! Help them travel through mountains, forests and more to get the fox home in this enjoyable story about friendship. This educational game will get children excited about learning because it blends fun and teaching in an entertaining way. 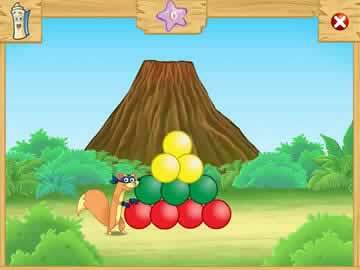 Children will move Swiper across the screen to collect stars. This includes jumping into trees, bouncing on balls and avoiding scary spiders and bats. Children will learn about colors, music and more with fun games and collectable items like musical instruments. Dora is a fun and friendly teacher for children as they work on listening, thinking and memory skills. One of the most important things a child can learn is that learning is fun and valuable. Dora and her amusing friends teach children this and other skills that will help children for the rest of their lives. The blend of platform game excitement and memorable lessons will make children excited to come back for more! Help the baby fox get home now in Dora the Explorer: Swiper's Big Adventure!